When a current carrying a conductor is kept in a magnetic field the conductor moves, if it is allowed to do so. This is called motor effect. The machine used to convert electrical energy into mechanical energy is called electric motor. It works on the principle of motor effect. It is used in domestic appliances such as electric fans, washing machines, vacuum cleaners, water pumps, etc. Adjust a dry cell, a coil and two paper clips as shown in the diagram. Now take a powerful magnet close to the coil and observe the motor effect. Remember the coil should be of thin wire and maximum of 10 turns. The ends of the coil should be rubbed with sand paper for conduction. Fleming’s left hand rule is used to determine the direction of motion of a motor. It states that if the first three fingers of the right hand are held mutually perpendicular to each other, with the index finger in the direction of magnetic flux and the middle finger in the direction of electric current, the thumb points to the direction of the motion of the motor. Structure: A bicycle dynamo consists of a permanent magnet and a coil of insulated copper wire wound on a laminated soft iron core. 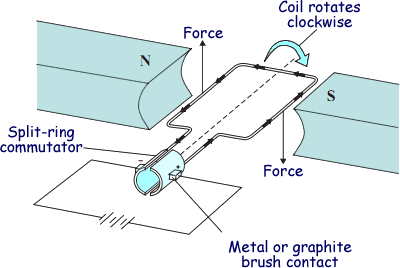 The coil is kept in the magnetic field of a magnet. The magnet is connected with the cup or head of the dynamo with an axle. Working: When the wheel of the bicycle rotates, it causes the head of the dynamo to rotate, which in turn rotates the permanent magnet. Thus, the magnetic flux passing through the coil changes and an e.m.f. is induced in it. It is D.C. in nature. It consists of magnet, armature, rings and carbon brushes. The armature consists of a rectangular coil of insulated copper wire wound on a laminated soft iron core. It is capable of rotation about an axis perpendicular to a uniform magnetic field produced by an electromagnet. The ends of the coil are connected to the copper rings called slip rings. When the armature rotates, the ring also rotates. The rings are insulated from each other. There are two carbon brushes which press lightly against each ring. These brushes are connected to the external load resistance. In this model, galvanometer is connected. When the coil is rotated in the magnetic field, the magnetic flux passing through the coil changes and by Faraday’s law, e.m.f. is induced in it. The induced e.m.f. obtained is A.C. in nature. The mechanical energy needed for the rotation is obtained from the water turbine or steam turbine or wind power or petrol, diesel, etc. Fleming’s right hand rule is used to determine the direction of the induced current in the generator. The rule states that if the first three fingers of the right hand are held mutually perpendicular to each other, with the index finger in the direction of magnetic flux and the thumb in the direction of motion of coil, the middle finger points to the direction of the induced current. A bicycle dynamo consists of a permanent magnet and a coil of insulated copper wire wound on a laminated soft iron core. Fleming’s right hand rule is used to determine the direction of the induced current in the generator. When a current carrying a conductor is kept in a magnetic field the conductor moves, if it is allowed to do so. This is called motor effect. The machine used to convert electrical energy into mechanical energy is called electric motor. It works on the principle of motor effect. Electric motor is used in domestic appliances such as electric fans, washing machines, vacuum cleaners, water pumps, etc. Fleming’s left hand rule is used to determine the direction of motion of a motor. Fleming’s left hand rule states that if the first three fingers of the right hand are held mutually perpendicular to each other, with the index finger in the direction of magnetic flux and the middle finger in the direction of electric current, the thumb points to the direction of the motion of the motor. By increasing the number of turns in the coil, strength of magnetic field, speed of rotation of the coil in the magnetic field and by decreasing the distance between the coil and the magnet the magnitude of the induced e.m.f. can be increased in generator/dynamo. Fleming’s right hand rule states that if the first three fingers of the right hand are held mutually perpendicular to each other, with the index finger in the direction of magnetic flux and the thumb in the direction of motion of coil, the middle finger points to the direction of the induced current. 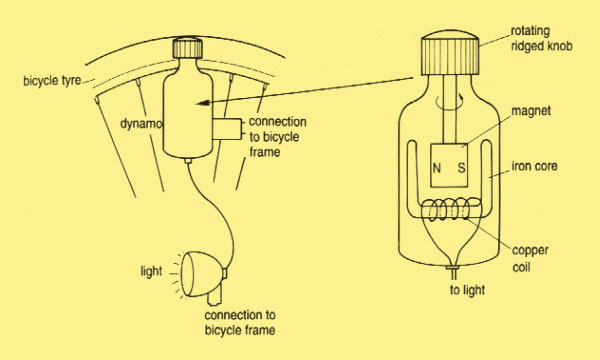 How is current electricity generated from bicycle dynamo? When the wheel of bicycle moves, it makes the head of the dynamo to rotate, which inturn rotates the permanent magnet. Thus, the magnetic flux passing through the coil changes and by Faradays law an emf is induced in it. In this way, current electricity is generated from bicycle dynamo. On the basis of which principle does the dynamo works? Dynamo works on the basis of Faradays Law of electro-magnetic induction. What is the effect of brightness in a bulb when it is resolved with a high speed and why? The brightness of bulb is increased by resolving with a high speed, the great amount of induced current is produced. Dynamo is defined as the device which converts mechanical energy into electrical energy. According to which rule, if the first three fingers of the right hand are held mutually perpendicular to each other, with the index finger in the direction of magnetic flux and the thumb in the direction of motion of coil, the middle finger points to the direction of the induced current? When a current carrying a conductor is kept in a magnetic field the conductor moves, if it is allowed to do so. This is called ______. Electric motor is the machine used to convert ______. Electric motor works on the principle of _______. Fleming's left hand rule is used to determine the direction of motion of a ______. Which rule states that if the first three fingers of the right hand are held mutually perpendicular to each other, with the index finger in the direction of magnetic flux and the middle finger in the direction of electric current, the thumb points to the direction of the motion of the motor? What happens if alternating current is passed through dynamo? what happens if a.c current is passed through dynamo? Any Questions on 'Electric Motor and Bicycle Dynamo '?